A new piano album by Laura Sullivan is planned for release later this year in October of 2012. Laura Sullivan classifies her music influences in the style of Enya and Yanni, with piano melodies likened to Liz Story, George Winston and David Lanz, but clearly, Laura Sullivan is within an artistic category of her own making. Admired for her graceful solo piano releases, some piano albums have artists performing instrumentals of cello, guitar, violin and keyboards. 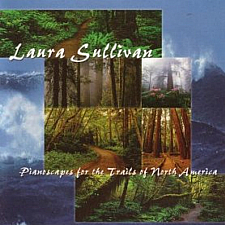 Laura Sullivan’s Pianoscapes for the Trails of North America is an elegant piano and instrumental release presenting America’s grandeur with a sense of wonder and admiration. Although Laura Sullivan is recognized for piano music in the adult contemporary, classical and new age music styles, she is also a vocalist who composes, arranges and records almost all of her own music. Until later in October when Laura Sullivan releases her new piano album for 2012, here is her Hope for the Trees song video from her album Pianoscapes for the Trails of North America. Hope for the Trees is a song featuring Laura and artists who accompany her on cello, guitar, keyboards and violin. Pianist Laura Sullivan is also a featured artist on the Free New Age Piano App for iPhone, iPad, and iPod Touch. On the New Age Piano app, you can listen to 3 full length songs by Laura Sullivan for free, along with 56 additional songs from 20 of today’s top New Age pianists. Visit Laura-Sullivan.com homepage to find out more. Sample or purchase albums at her online store, or visit Amazon.com. Photo is courtesy Laura Sullivan.